An outstanding all-purpose back in college, Anderson received All-Southwestern Conference honors in 1982 and was chosen in the first round (20th overall) of the 1983 NFL draft by the San Diego Chargers and in the USFL draft by the New Jersey Generals (fifth overall). The Chargers intended to convert him into a wide receiver, but Anderson expressed an interest in playing for Tampa Bay of the new spring league, and his draft rights were accordingly dealt to the Bandits. He didn’t join the team until halfway through the ’83 season but had an impact when he did, rushing for 516 yards on 97 carries (5.3 avg.) and catching 29 passes for 347 yards in eight games. In 1984, Anderson led the league in rushing touchdowns (19) and touchdowns overall (21, tied with Herschel Walker) while gaining 1008 yards on 268 carries and catching 66 passes for 682 more yards. He had another outstanding season in ‘85, rushing for 1207 yards, catching 72 passes for 678 yards, and scoring a total of 20 touchdowns. He was named to the official USFL All-League team and was also an All-USFL selection by The Sporting News. 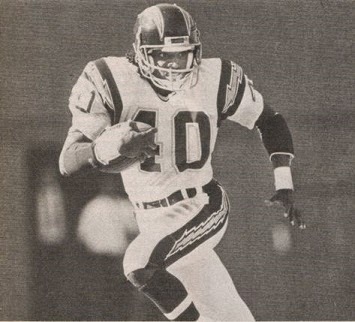 With the demise of the USFL, Anderson joined the Chargers during the ’85 NFL season and accumulated 1153 all-purpose yards in 12 games. Chargers went 4-12 to finish fifth in the AFC West. Anderson had a lesser year in the strike-interrupted 1987 season while splitting time with Curtis Adams at halfback, but rushed for 1119 yards in ’88. A contract dispute led to his sitting out in 1989 and he was traded to the Tampa Bay Buccaneers in ’90. While Anderson gained 1110 yards from scrimmage that year despite dealing with nagging injuries, his production dropped off significantly thereafter as he was used more as a specialty receiver out of the backfield. He finished up with Detroit, who obtained him during the ’93 season. Anderson came out of retirement in 1995 to play for the Memphis Mad Dogs of the CFL, rushing for 250 yards and catching 28 passes in his final pro season. Overall in the USFL, Anderson rushed for 2731 yards on 641 attempts (4.3 avg. ), had another 1707 yards on 167 catches, and scored 45 touchdowns. In the NFL, he gained 3409 yards on the ground, 2999 on 302 pass receptions, and adding in kick returns accumulated 9572 all-purpose yards while scoring 32 TDs.